To ensure vibrant, economic growth, we fully recognize that innovative industry clusters require access to human capital with appropriate education and training. This fact, and challenges associated with it, has once again been highlighted with viable solutions recommended in a recent report prepared by TEConomy Partners, LLC for AgriNovus Indiana. The report finds that for Indiana to maintain its position as a 21st century agbioscience leader, Indiana must have a 21st Century agbioscience workforce equipped to understand, apply, and develop leading technologies. This will require Indiana to go beyond traditional paradigms of education by integrating agbioscience skills development across the full talent pipeline composed of K–12, colleges and universities, and continued professional development. Create a greater pipeline of students interested in agbioscience careers. Develop industry-relevant skill sets for core occupation talent. 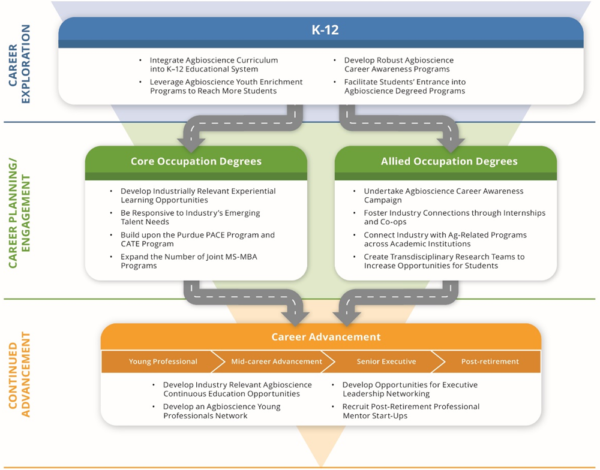 Increase agbioscience career engagement for allied occupation fields. These four strategies are best understood as interrelated efforts that reinforce each other and create a progression as depicted in the figure below. No one single action or strategy will fully address Indiana’s agbioscience talent demands and gaps. Instead, a multidimensional approach is needed that reflects the variety of opportunities and needs that Indiana’s agbioscience industry faces. The agbioscience industry’s ability to develop, cultivate, and acquire specialized human talent with specific and unique skill sets throughout the entire talent pipeline is paramount to its ability to continue to grow and prosper in the State of Indiana. To learn more, click here to download the full report.